Norwalk – La Mirada Plumbing is the city of Cerritos’ most trusted plumber. Whether your problem is something to do with plumbing, heating, or you need to completely redesign your plumbing, our qualified technicians can get the job done right the first time. We want the best for our customers and we are confident they are getting the best when they hire us to handle all of their plumbing and HVAC needs. Give us a call today to make an appointment. Plumbing professional is not just a phrase, it means experience and reputation. And it is not about whether plumbing issues will ever arise at your home, it is just a matter of time. In case when plumbing does malfunction, you have two options – you can either attempt a DIY project or hire a professional plumber to do quality job. Hiring a professional plumber from a highly regarded company will ensure quality results and long-term service of any plumbing repairs. Some major benefits of hiring professional plumbers are mentioned below. They are experienced in the plumbing services. Most likely an experienced plumber has spent many years in business, thus there is hardly any plumbing problem he cannot cope with. There is enough professional plumbing equipment in plumbers’ vans. Their tools are more advanced, allowing the plumbers to get to work as soon as you might require their services. The plumber should be licensed and secured. A plumber’s license means that he has passed the specific requirements of the state, which incorporate possessing the essential mental abilities to handle the plumbing job. Usually such knowledge is obtained through formal education, training and seminars. Hiring a knowledgeable plumber means peace of mind and assurance for the homeowner. Less effort on your part and probable saving of money. If you choose the right contractor, he will not only fix your plumbing issue, he will be able to save you some money, because the expert can do the work right the first time. The right plumber also means little to no participation on your part in order to provide a solution. Just make a phone call and your plumbing crisis will be eliminated! It you live in Cerritos, call Norwalk/ La Mirada Plumbing, Heating &Air Conditioning and we will provide you with the professional you need! If you are planning to build a new home or business, you will definitely need a plumber who specializes in new construction so that your new plumbing fixtures and units can be installed and fully functional from the very beginning. 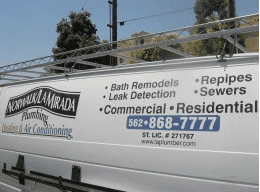 At Norwalk/ La Mirada Plumbing, Heating &Air Conditioning our customers can use the new construction services of professional and trustworthy plumbers with a personal touch for both residential and commercial facilities. Our new construction plumbing services include utility and septic system connections, water heaters, plumbing pipe installation, gas line and plumbing fixture installations and much more. Having been in plumbing business for over 50 years, we know that every client is important. That’s why our plumbers do their best to meet the customers’ expectations on every project, striving to deliver friendly and unique service every time without exceptions. Whether you are a homeowner constructing a new home, a commercial client or general contractor building new sites, at Norwalk/ La Mirada Plumbing we are capable of providing the new construction plumbing services you require. Our plumbers train constantly and intensely, focusing on new construction plumbing methods and techniques. You can be confident in our exceptional plumbing services! There are different types of plumbing leaks but no matter their size or type, leaks can damage your residential or commercial facility, encourage undesirable organic growth, and waste gallons of water. Leaks can also be hidden and since you don’t see most of the plumbing fixtures at your home, you might be oblivious that a leak has already formed. Knowing the causes of plumbing leaks can help homeowners to prevent leaks from forming in the future. Receive $20 off any service in the city of Cerritos!